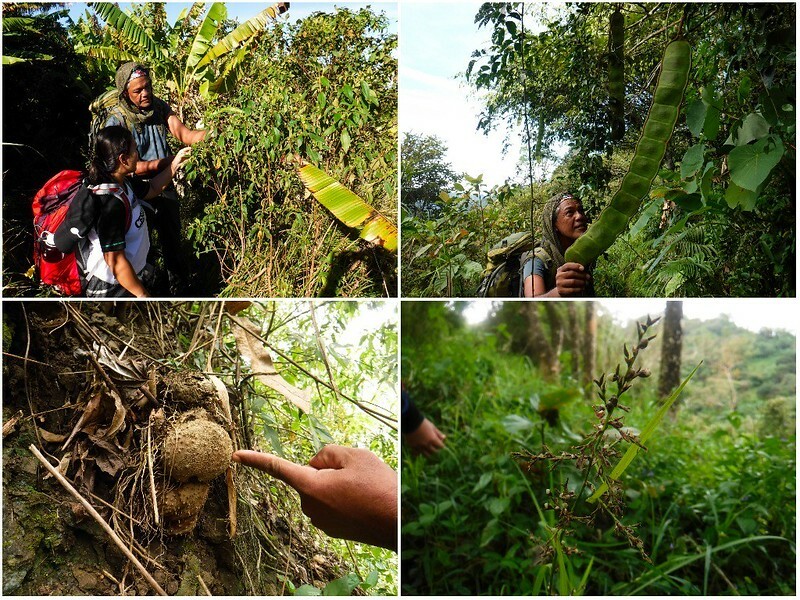 The Cebu Highlands Trail (CHT) is the 6-year master project of Mr. Jing Lavilles de Egurolla, an avid outdoorsman, founder of the local bushcrafter’s guild Camp Red, and the owner of the bushcrafting blog Warrior Pilgrimage by Pinoy Apache. 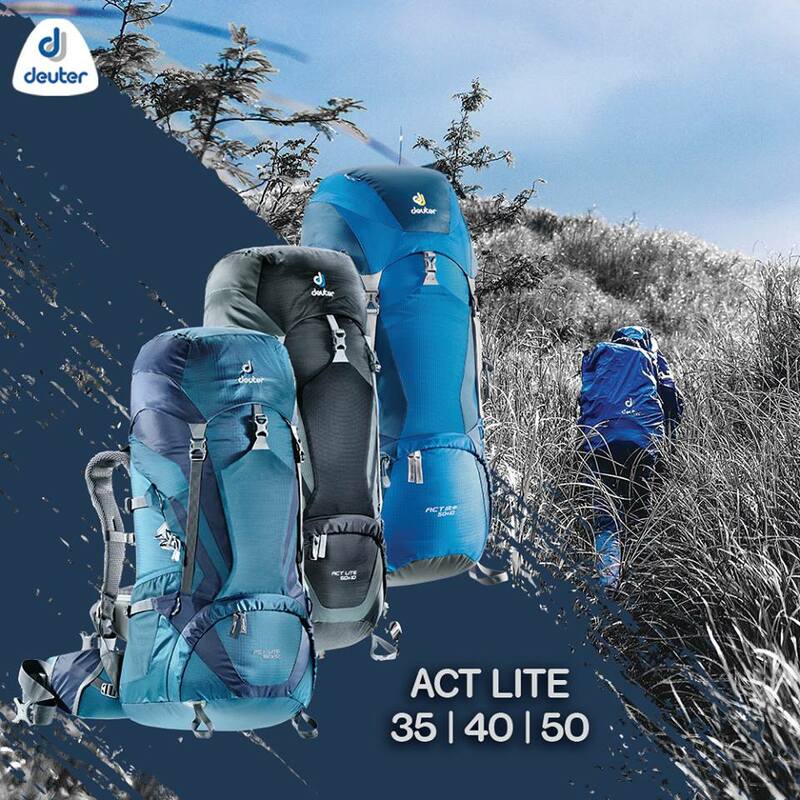 The 400-kilometer trail is inspired and patterned after the long-distance hiking trails in the US, Canada, and Europe. And this year, we finally got the chance not just to try out his labor of love and but also to accomplish one of our dream adventures. Note: Since we are full-time employees and we can’t do a month-long thru-hike, we decided to hike the trail by sub-segments, each sub-segment lasting a weekend. We initially planned to condense the entire weekend’s adventure into one entry. However, there are so many interesting things that we experienced during our Segment 1A hike that we felt it would dishonor the trail and the work of the man if we shorten it. Thus, we decided to write one entry for each day we spent on the CHT. We started our CHT hike with a hot breakfast at a local Jollibee outlet where we met up with Sir Jing. 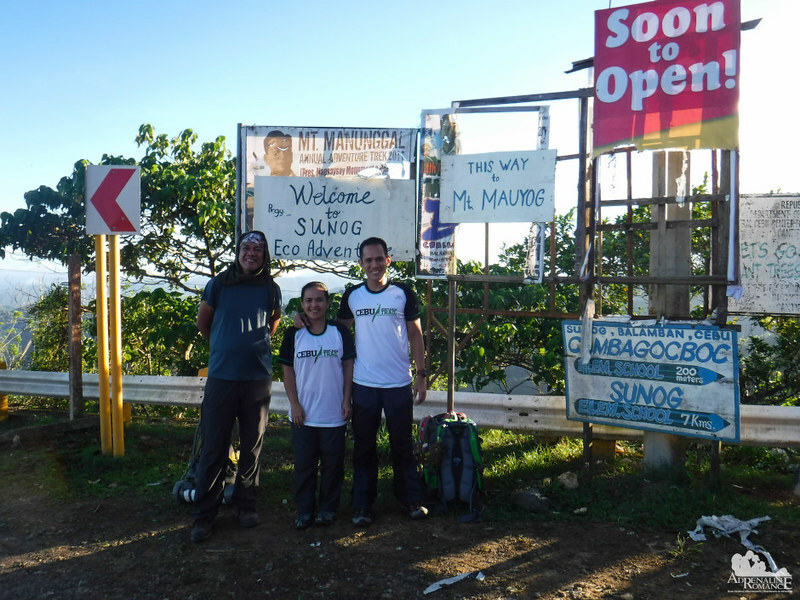 After a one-hour V-hire ride to the highlands of Cebu via the Transcentral Highway, we arrived at the trailhead of Mt. Manunggal in Barangay Magsaysay (formerly Sunog) in the municipality of Balamban. The air was clear and cool, while the early morning sky was bright and sunny. Everything looked towards a promise of a great hike. We then rode habal-habals to reach our jump-off point at the registration area of Mt. Manunggal. After arranging our packs and taking out our trail snacks, we took our first step in fulfilling a grand endeavor in our adventure wishlist. We walked past Mt. Manunggal’s campsite where we saw campers starting to cook their breakfast. They looked at us with bewilderment, probably wondering why we just passed by and not set up camp. Turning right from Mt. 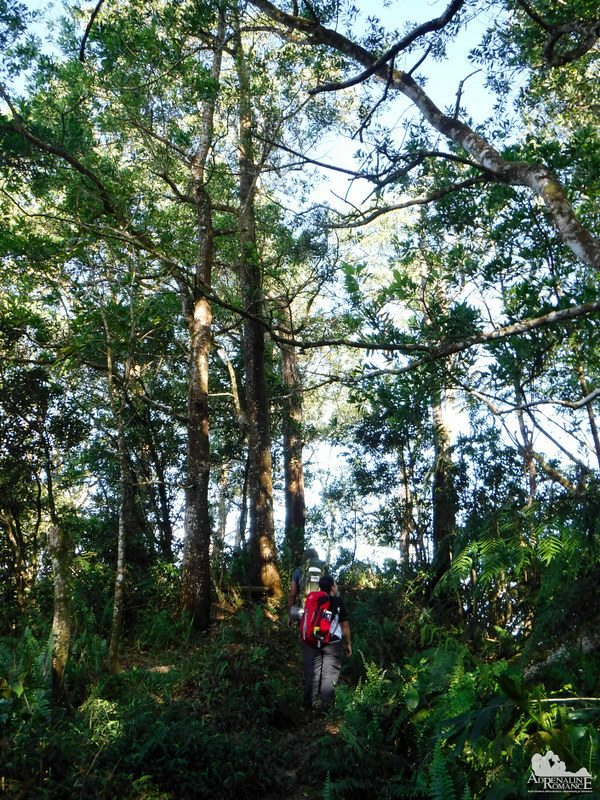 Manunggal’s campsite, we entered a thick and ancient conifer forest. Conifer and pine forests are common in the Philippine highlands, especially in the Cordilleras, where the air is much cooler and the mountainous terrain is much more conducive for these trees to grow. It’s quite wonderful we have these conifers right here in our island. Trekking through this fresh and fragrant conifer forest is like walking on a hiking trail of a temperate foreign land. We walked along rolling terrain until we exited the pine forest. 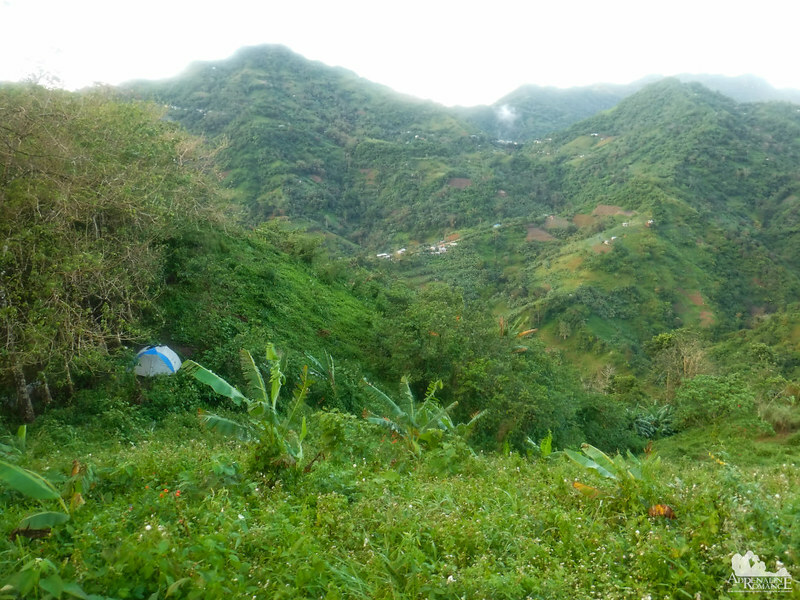 Right before us was a breathtaking view of Balamban’s mountains and valleys. While large swatches of woods were cleared long ago to give way to farmlands and towns, there are still large areas of healthy dipterocarp forests. 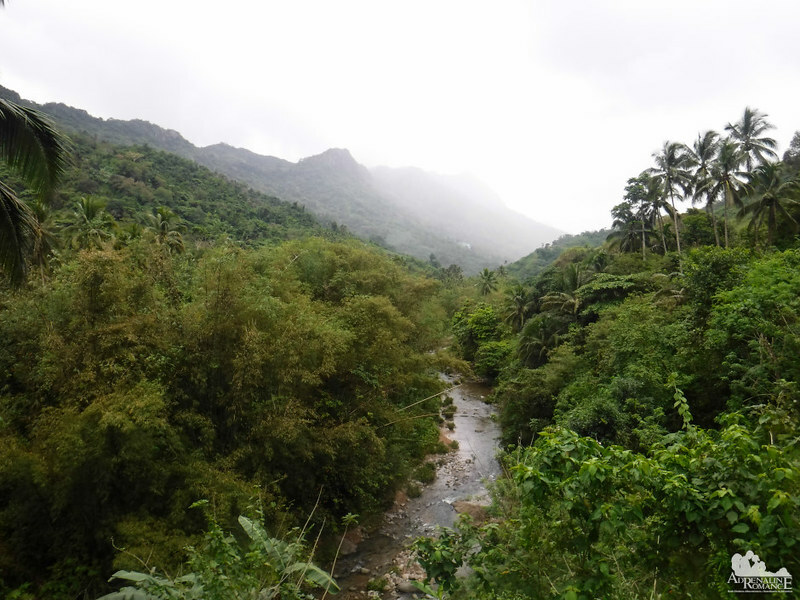 These forests offer refuge to Cebu’s indigenous fauna, protect slopes from erosion, and act as water reservoirs. We paused here for a while to survey our surroundings. Miles away, we could see a barely discernible white strip nestled on a valley between two mountains. See that tiny white dash near the right side of the photo below? Sir Jing said that’s sitio Inalad where we will have our lunch. With a steady but relaxed pace, we should be there by noon. One of the best things about Sir Jing being our guide was that he didn’t give us the silent treatment. This venerable bushman is truly an expert in his game. On the way, he taught us basic plant identification. Yes, you can say that hiking the CHT with Sir Jing is not an adventure but a practical and educational outdoor class! Indian rhododendron (Visayan term: Yagumyum): The leaves can be used as a natural material to clean off greasy plates and pots. Matchbox bean (Visayan term: Barugo or Gogo): Indigenous people use pulps from the seeds to be used as a shampoo. Millet (Visayan term: Kabog): This is the staple food of ancient Cebuanos before the Spaniards came. Asiatic bitter yam (Visayan term: Kobong): A famine food. If not processed properly, this can be harmful to the body. Sir Jing also taught us how to read animal tracks. This set belongs to a carabao (water buffalo). He quizzed us about the direction of where the animal was heading to. 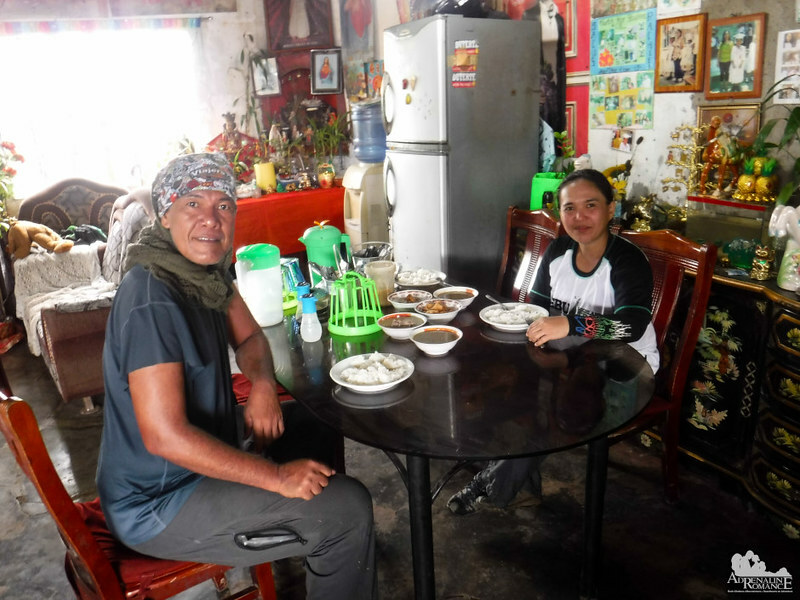 This man’s knowledge, gained after long decades of outdoor experience augmented by passionate study of Cebuano culture, is totally impressive. Inalad is around 8 kilometers from Mt. 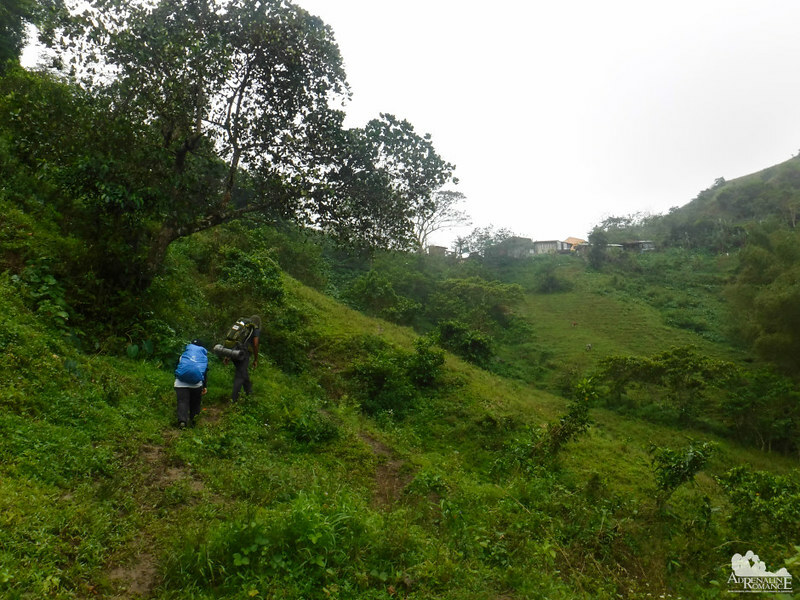 Manunggal, which is quite a hike over rough, ascending, descending, muddy, loose soil, or foliage-covered trails. Thus, we agreed to have a rest stop for 5 minutes for every hour of walking. A few of our stops were nothing more than small clearings at the side of the trail. But sometimes, we come across small houses where the owners readily allow us to rest on their property. Some were so kind that they offered us water or fresh produce from their farm. 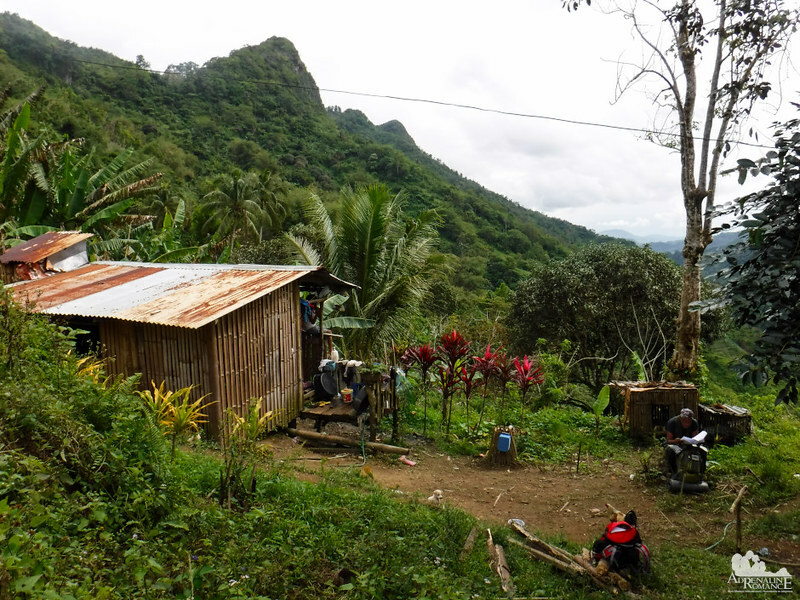 Filipino hospitality is everywhere, even in this remote part of Cebu. We reached beautiful Lusaran River at the foot of the mountain range where Mt. Manunggal belongs to. The river sparkles with clean, cool, fresh water. Locals source out water for their farms and household use here, making Lusaran River an important artery in their daily lives. Unfortunately, it is threatened by the small-scale quarrying industries near Tabunan. Left unabated, the quarrying activities can divert the current and drain the river dry. We hope that won’t happen. What started out as a bright morning rapidly turned into an ominous day. Far away, we could hear rolling thunder. The skies turned gray, and we could see rain clouds on the horizon. The air became heavy with moisture. 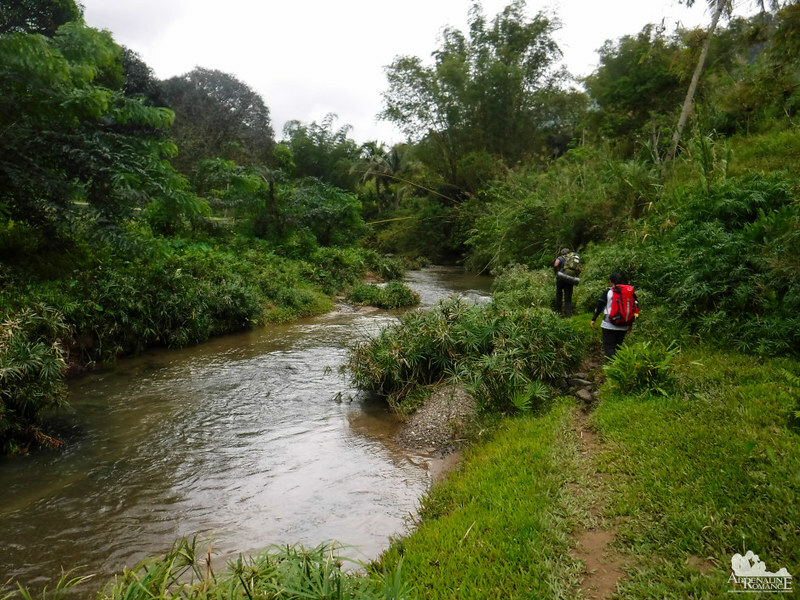 Knowing that rivers can suddenly and unexpectedly turn into deadly flashfloods, we crossed Lusaran River in a hurry. We made six such crossings at different parts of the Lusaran River. And the best thing about river crossing? The cool water and the pebbly riverbed gave our feet a wonderful natural massage! Looking for greener pastures? You can find them here hidden in the middle of Cebu! The moos of cows, crowing of roosters, and the rustling of the wind all combine into a quiet, serene symphony. Moderate rainfall overtook us, which was somewhat a blessing in disguise. Yes, the steep uphill climb from Lusaran River was muddy and slippery. On the other hand, the cool rain washed away our sweat and exhaustion. After more than four hours of trekking, we finally arrived at Inalad where we will take our much-deserved lunch. 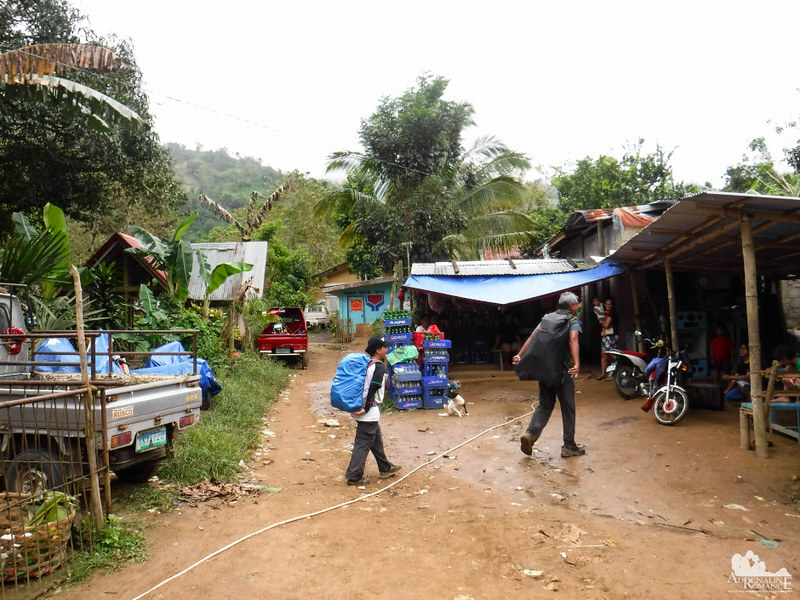 Inalad is a sitio of Gaas and a border marketplace straddling the municipalities of Balamban, Tabunan, and Toledo. From the lip of Inalad, which straddled the Transcentral Highway, we did an about-face to silently admire the view of the valley. From afar, we could see the fog-covered peak of Mt. Manunggal. 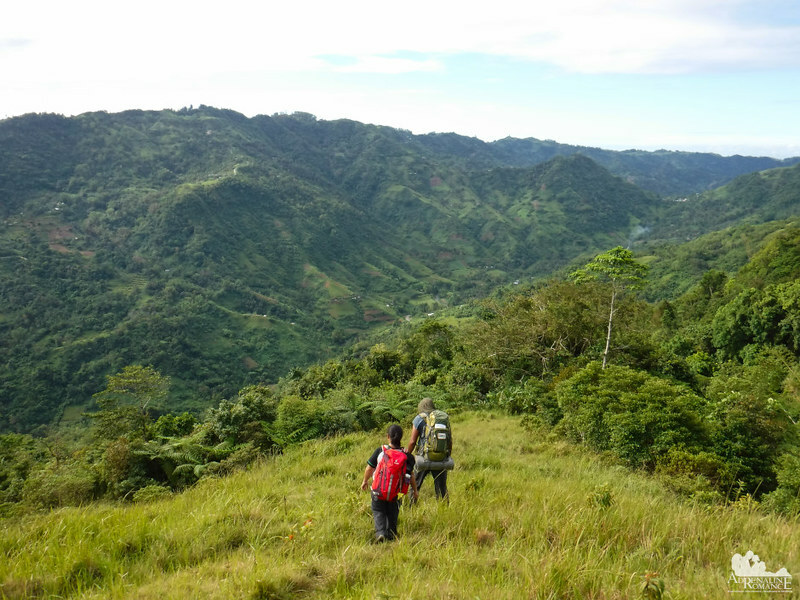 We have climbed many impressive mountains around the Philippines and thought that Cebu’s mountains are minuscule compared to them. But upon seeing this view, we suddenly realized that our island has an unspoken grandness—grandness that can only be experienced by those who are willing to shed sweat, bear the pain, and keep an open mind. A kind resident of Inalad allowed us to take our lunch in their humble home-turned carenderia. Our bodies—dirty and haggard—emitted visible steam, but she didn’t mind our ragged looks at all. She simply smiled and served us hot monggo soup, fried eggplant, and pork stew. Sir Jing was suffering from a slight fever, so we rested for an hour in the carenderia. At 1 PM, under the heavy but refreshing rain, we resumed our trek. We started on the familiar paved surface of the Transcentral Highway and turned right on a dirt road to go downhill. The dirt road is an important commercial artery for local farmers. Here they wait for large trucks that will carry their produce to the wet markets around Metro Cebu. Check out that fat produce. 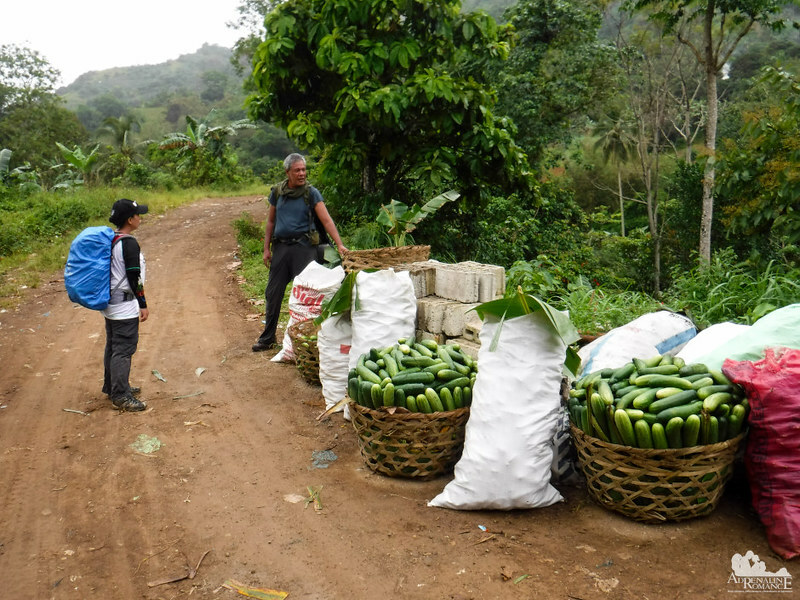 The fertile soil in Cebu’s mountains makes it possible for vegetables to grow healthy. Half an hour later, we arrived at Barangay Tongkay. Before proceeding to our campsite, we had a courtesy call to the barangay captain. As visitors to a new place, it is only proper to get ourselves be recognized and acknowledged by locals. After stating our intention to camp up at the nearby Mt. Tongkay, we bought some extra water, spices, and snacks to bring to our campsite. With the formalities over, we started our ascent up Mt. 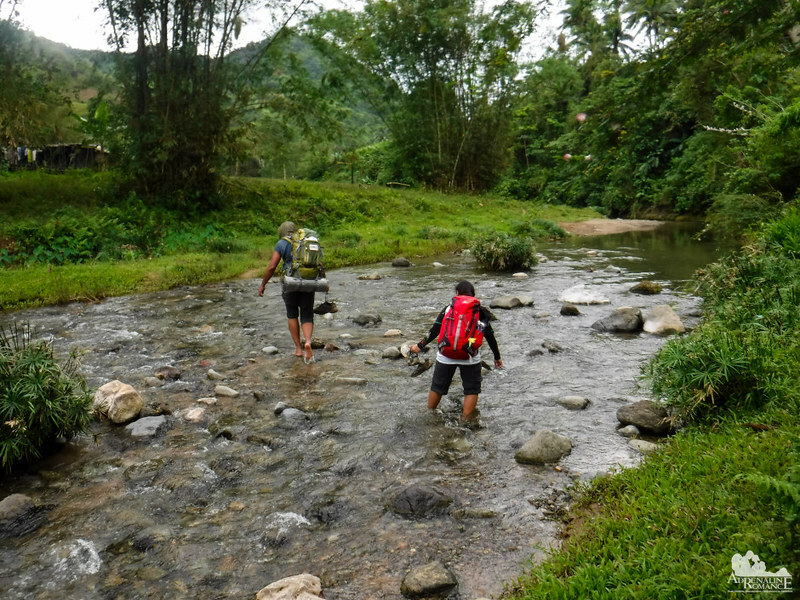 Tongkay, which is largely unknown to the outdoor community. 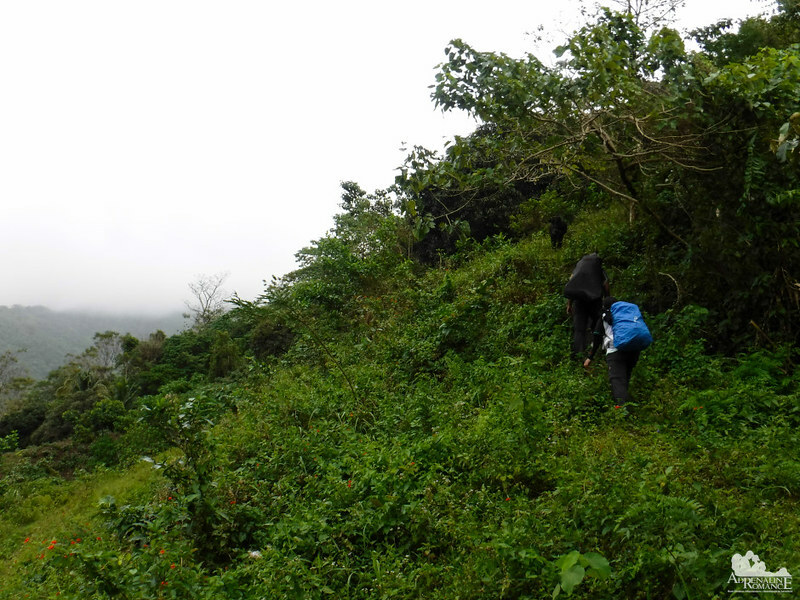 The ascent started with a relatively steep gradient that increases as we trekked higher. Since only a few people walk by here—except perhaps for the occasional farmer—the trail was hardly discernible and thick with vegetation. Purple nettle (Visayan term: Mayana): Locals use these herbs to treat sores and fevers. Capsicum frutescens cultivar (Visayan term: Sili kulikot): This is a very popular pepper that is squished in sauces and soups to make them hot and spicy. Don’t underestimate this tiny pepper! 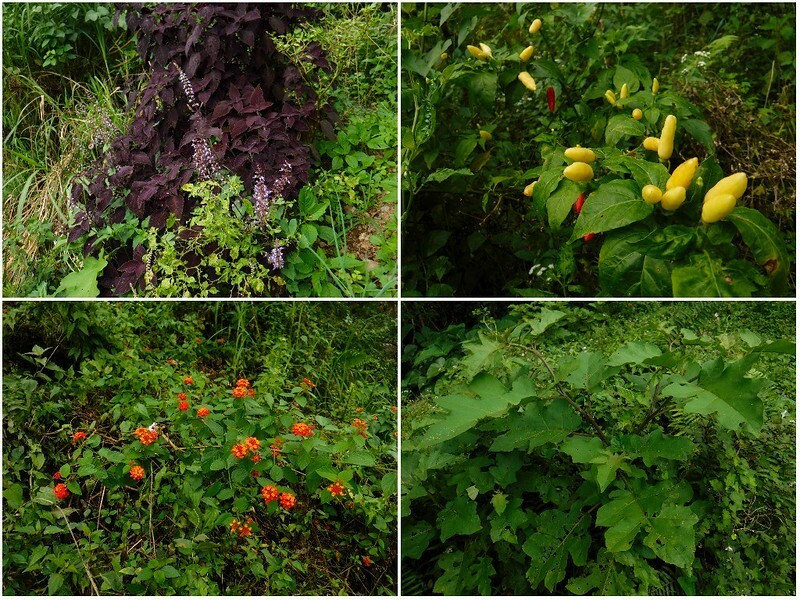 Poison berry (Visayan term: Talong-talong): This is a poisonous plant despite its appetizing name, which refers to eggplant. Although covered in vegetation in many places, it is definitely a trail that is still in use by locals. 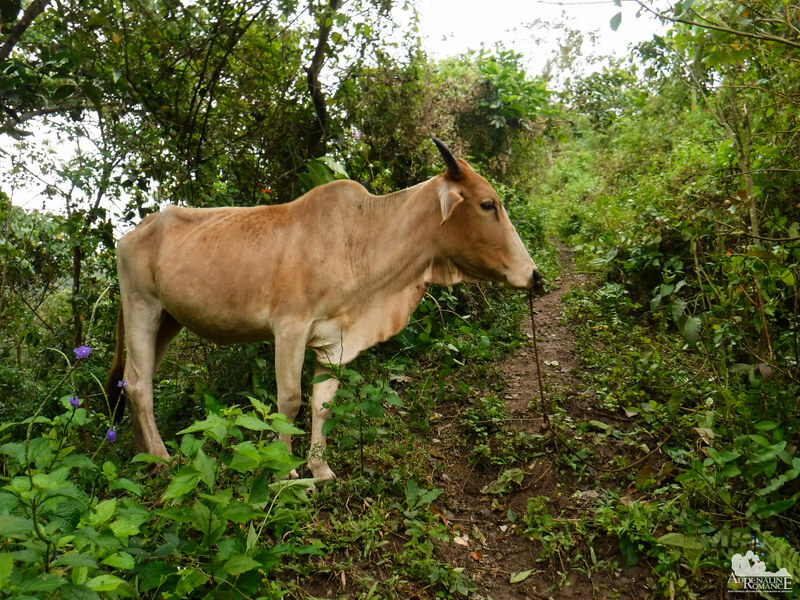 In fact, we spotted three cows blocking the way; this was the first one. Sir Jing taught us what to do on animal encounters like this. Even though it was obviously domesticated, we were careful not to spook the animal. Or else, it will ram us with its sharp horns. Strangely though, when it was my turn to pass by this cow, the guy approached me—yes, my heart skipped a beat—and licked my hand with its rough tongue. Hahaha! We also passed by “hidden” farms like these. Well, they’re not exactly secret. It’s just that the trees conceal these farms from view. As we went higher up the mountain, the trail became steeper. Making the ascent more difficult was the fact that it rained steadily through the afternoon, and the freshly plowed soil became soft and muddy. 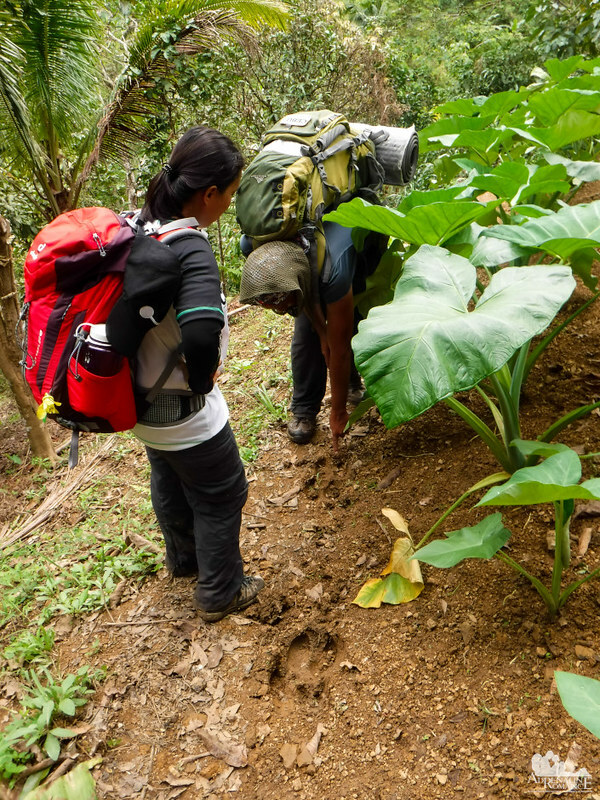 The surface became harder to walk on, and thick layers of mud caked our trekking shoes. 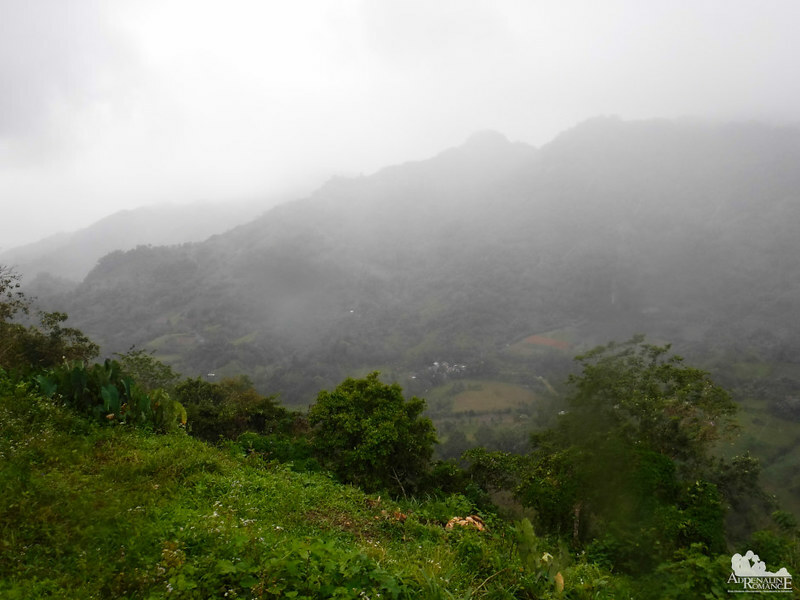 Local farmers usually plow mountainsides to take advantage of the fertile loam. 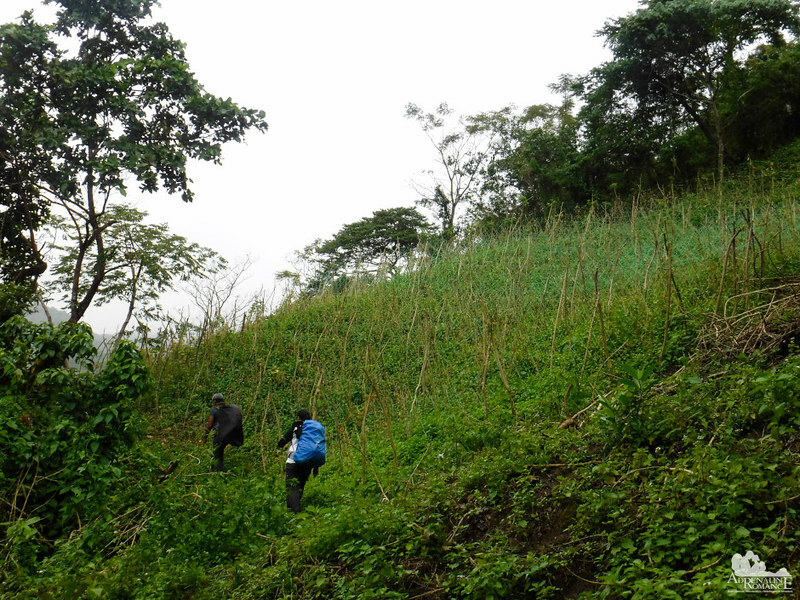 The trade-off is that slopes become more vulnerable to landslides and erosion. Thankfully, the rain slowed down to a drizzle. As the land warmed up, the fog started to lift, giving us an ethereal view of the landscape below. 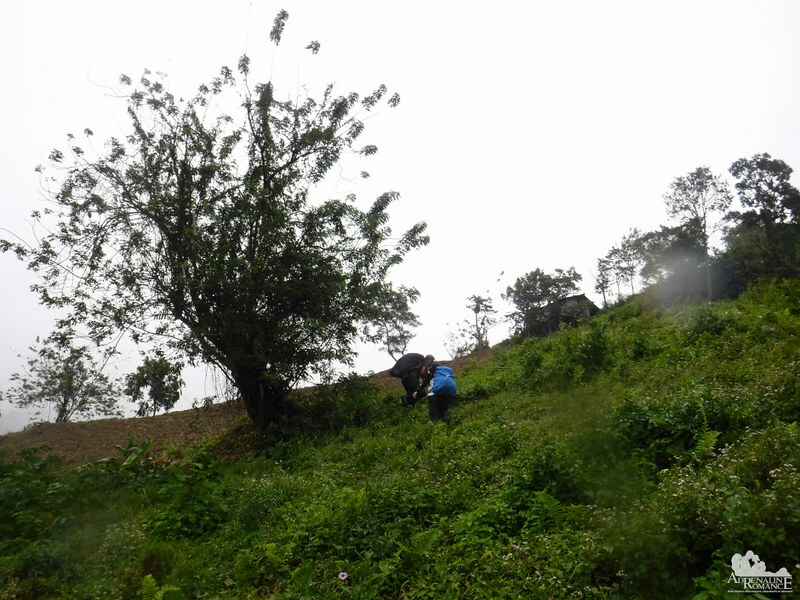 Finally, at 4 PM, after one and a half hours of climbing, we reached a narrow, flat area at the mountain’s shoulder. We have reached our campsite. And what a record it was! Thanks to our steady pace and strict observance of breaks, we arrived two hours earlier than planned! With the skies still gray, we know that the rain can come back anytime, so we quickly set up our new High Sierra tent before the heavens open up. Sir Jing had a large tarp, so we used it as a makeshift roof for our cooking area. We had a delicious early dinner of spicy Korean noodle soup, skinless chorizo, and fish fillet. With dinner out of the way, Sir Jing set up his own shelter—a cozy bivouac. 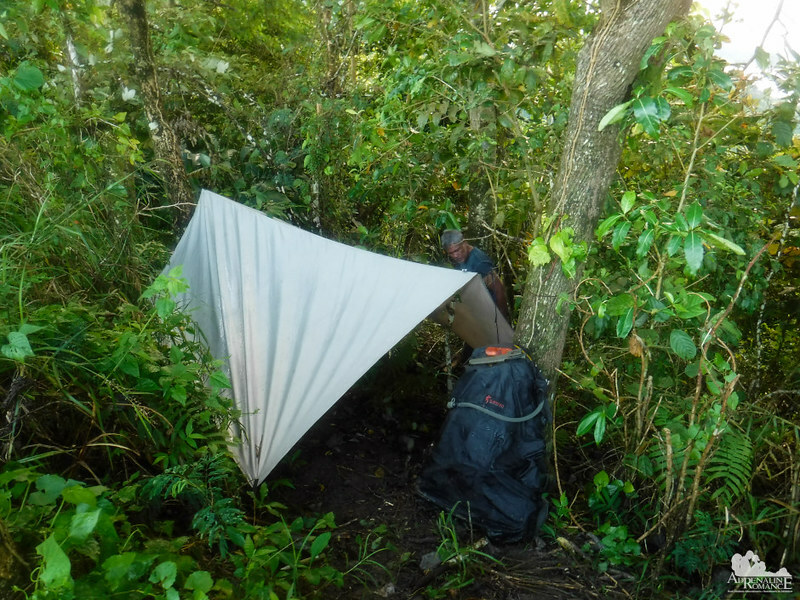 He re-positioned the canvas tarp into an A-tent to shelter a comfortable hammock underneath it. Check out the bivouac’s location. It’s completely unobtrusive and sheltered from wind and rain. The shower stopped, and rays of a pale afternoon sun started to penetrate the gray clouds. While Sweetie changed into dry clothes, I climbed a short slope so I could get a good view of our camp. As you can see, Sir Jing chose an ideal campsite. The thick grove of trees protected us from the brunt of gusts coming from the south. The slopes below and across us channeled northern and eastern winds into the valley. 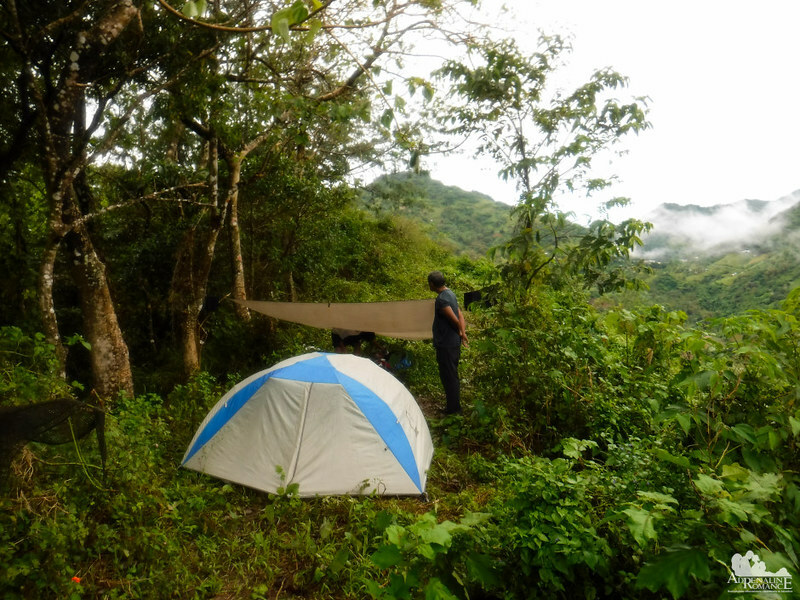 The camp’s location was so strategic that when we slept later, we only felt a cool, comfortable breeze rustling our shelters while strong winds howled across the valley below. 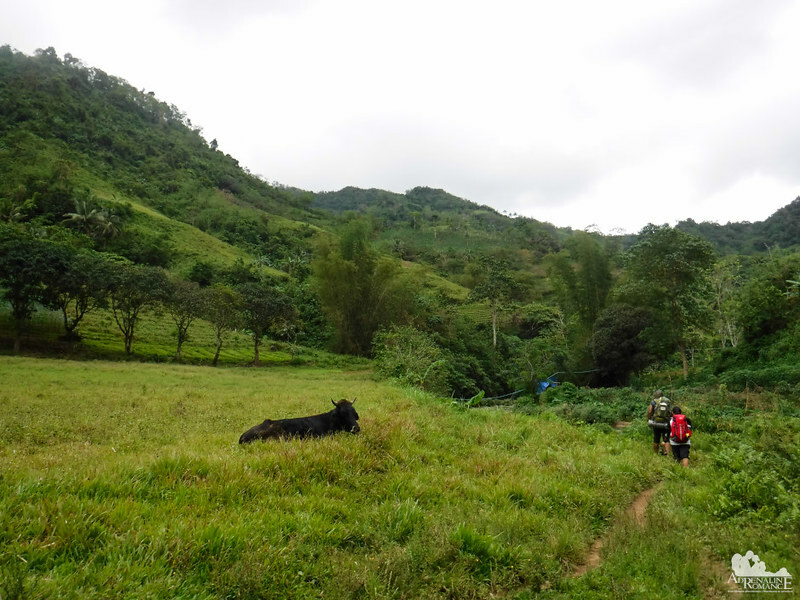 It was our very first experience on the Cebu Highlands Trail, and we know that this is just the start of a long adventure. We hiked roughly 15 kilometers on the first day—just a fraction of this amazing 400-kilometer hiking trail. But the ecstasy, happiness, and excitement of actually starting to accomplish something major in our adventure bucket list are beyond description. Part 2 of the CHT Segment 1A is in the next post. Itinerary, budget, and other tips for this sub-segment are included in the said article. 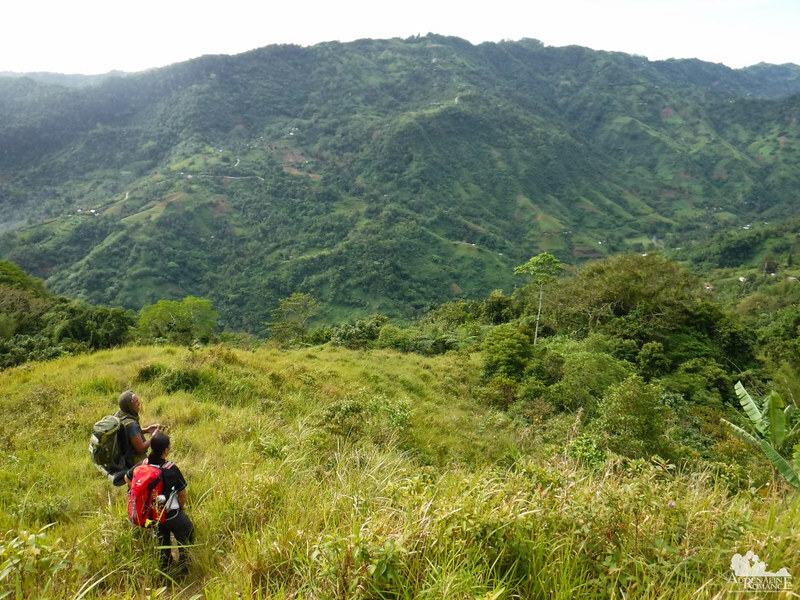 There are actually a lot of mountaineering groups in Cebu. We recall BASO, Sugbo Outdoors, Cebu Mountaineering Society, Camp Red, etc. You can easily get in touch with them through their Facebook Pages/Groups. Each of these groups have various climbs and treks during the weekends. 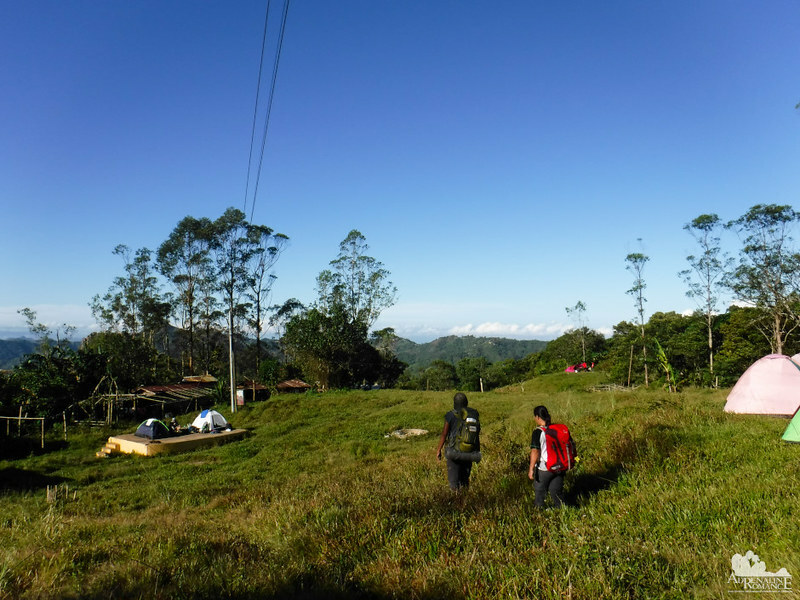 You can also check out our blog under the label Mountain Trekking. Virtually all our blog posts have useful information regarding contact details, itineraries, budgets, and tips in visiting these places, including mountains.